Bapi Das is exhibiting his work at the ongoing Kochi-Muziris Biennale. 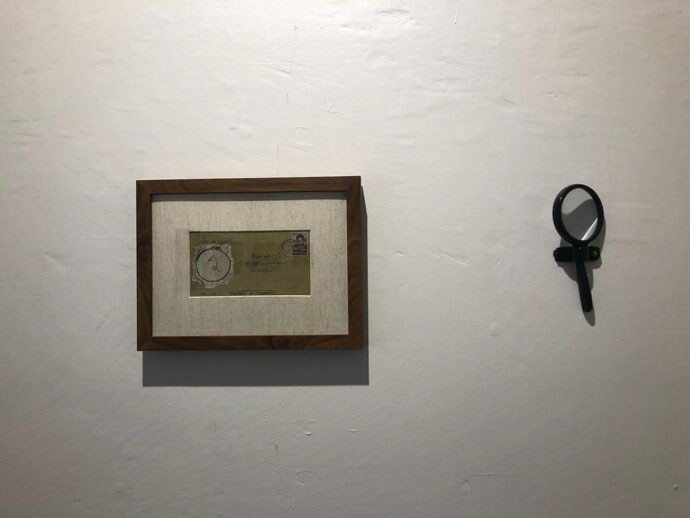 A magnifying glass hangs on the wall in a small room overlooking the sea, at Aspinwall House, Kochi, one of the venues of the Kochi-Muziris Biennale. To look at a life unfold, you must linger on the canvas. In the first frame, there is an intricately embroidered silhouette of a child releasing paper boats into the concrete road of a megapolis. There’s Kolkata in the background. For hours and days and months, 39-year-old Bapi Das has looked through a mounted magnifying glass in his one-room tenement in the squalid neighbourhood of north Kolkata’s Narkeldanga. 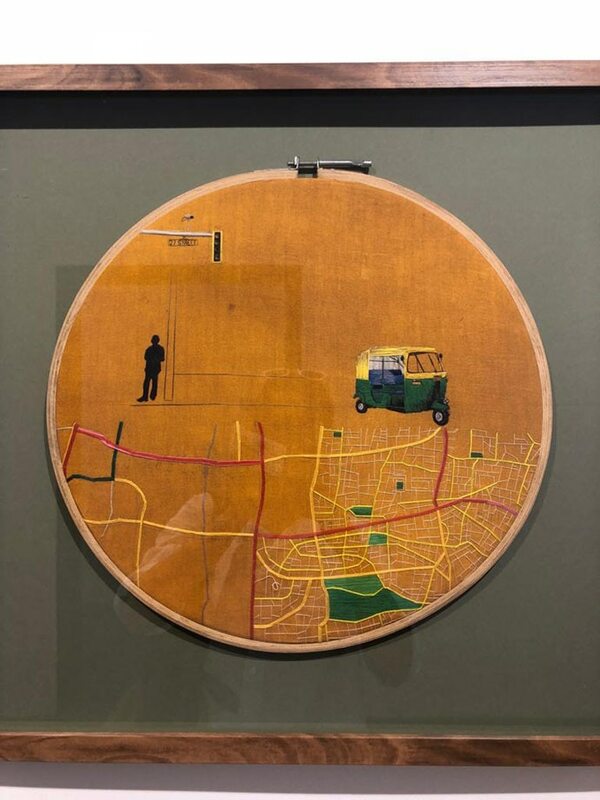 He has embroidered his perspectives of the city as seen through the rear view mirror of his autorickshaw, and woven a tapestry of dreams and reality through the changing landscape of Kolkata’s streets. To see this map of a lost city and a lost dream, you must therefore use the magnifying glass. He is an unassuming man. We sit with the sea in the distance and he talks about a life that was full of longings and objects seen in the rear view. Somehow, that became a metaphor for his own journey. They say objects in the rear view mirror are closer than they appear. And despite the distance from which he operates, the stories he has witnessed in the rear view mirror of his auto are closer to his own being than what they seem in the mirror. For instance, a migrant worker faced with a night of work, a bent back, empty eyes. 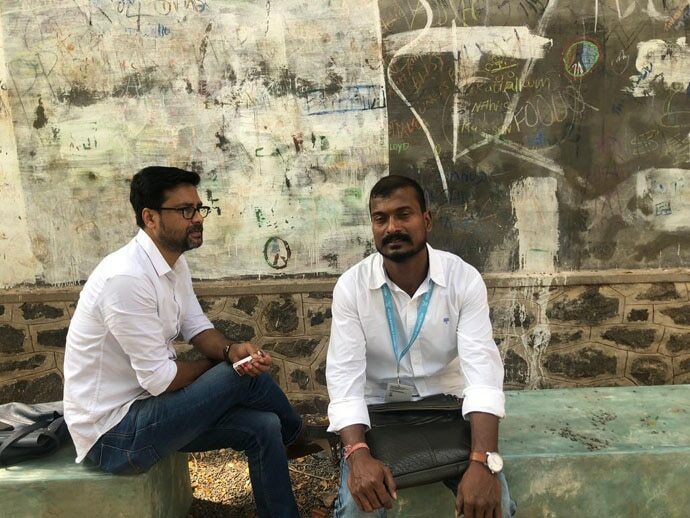 As one of the participating artists at the fourth edition of the Kochi-Muziris Biennale, Das represents a voice from the margins of the society, a sort of vindication of the dream of becoming an artist. But in the celebration of a man’s journey through the city, there is a pain of reconciliation. The last unfinished frame shows a man standing under a lamp post and an auto rickshaw in the background. Around 2007, Bapi met Kolkata-based artist Avijit Dutta to show him his drawings, which Dutta says weren’t very impressive. A month later, Bapi showed up with an embroidered handkerchief at the artist’s studio. “He had made a lotus leaf,” Dutta says. Bapi had gone to Darjeeling when he saw portraits of locals done in thread embroidery at the Ava Devi Museum. He says he wanted to do something different, and then made a portrait of his sister-in-law doing shringar in the ‘genre paintings’ style. On the frame, there are dribbles he cut out. The desire is expressed in ellipsis. The anger lingers on the frame, where Bapi also embroidered his own portrait. While he used thicker threads for the project, he later started extracting gossamer from soft dupattas, which required him to work painstakingly for weeks on a frame. But Bapi persisted and persevered through the months, and when the co-founder of the Kochi-Muziris Biennale, Bose Krishnamachari, saw his work at the Kalakriti Art Gallery in Hyderabad, Bapi was asked to be one of ‘voices from the margins’ for the KMB. The almost autobiographical work is representational of the life and times of a boy who was forced into manhood by his father’s abandonment. In the frames, you see the evolution of the city’s night lights. For someone who grew up poor and in darkness, these lights held hope. He drove in the night. The road maps are symbolic of the transition of his city and how the unions of auto drivers sought out routes where they could make more money. Sometimes, there is a worker in the city. 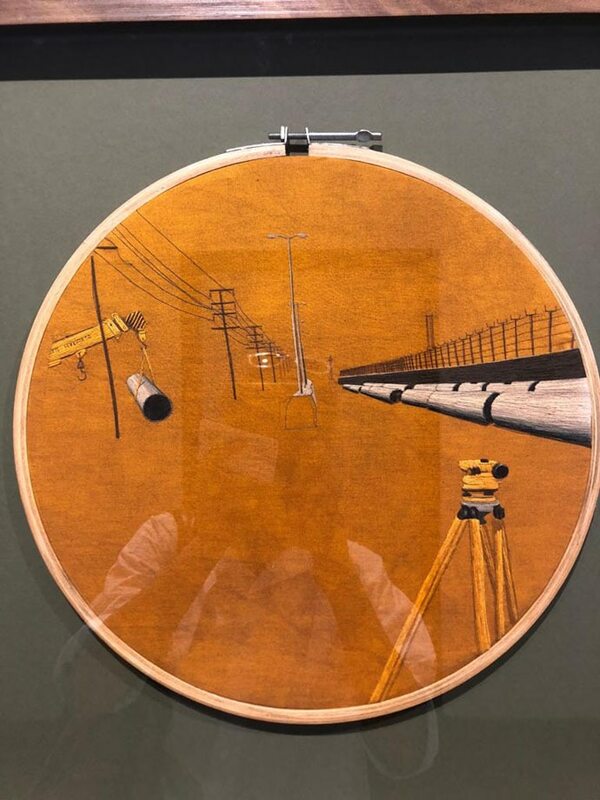 It is everything he saw while driving that he eventually embroidered on to the frames as part of his everyday, felt in his own subconscious, as he composed dream-like episodes that he says is his way of mapping his own memory through the city’s terrain. “From a paper boat to an auto… the dream ends,” he says. The yellow-and-green auto rickshaw is omnipresent in the frames. And what he sees is the pain of labour as he chooses to embroider a man laying bricks. ‘Missing Route 3’ is his ode to the city, with all its invisible people, its streets that glisten in the night, adoring the rains. For now, Bapi works as a gardener in a Hindu cemetery. He got his school-leaving certificate in 2008. In 2018, he also won an all-India gold medal for tapestry from the Prafulla Dahanukar Art Foundation. The countless microscopic stitches on the frame are also a political statement of how and what the poor see, and what cities are composed of. All the frames are unfinished. Perhaps because Bapi is still looking for closure. And his journey is elliptical. In the “to be continued” state, there is hope for a better future. A requiem for a dream. Rover in the driftless area of the outcastes. Writing is a way of deleting.